Assam Tea Employees Provident Fund Organization Recruitment 2018 : Good news for MCA background people. 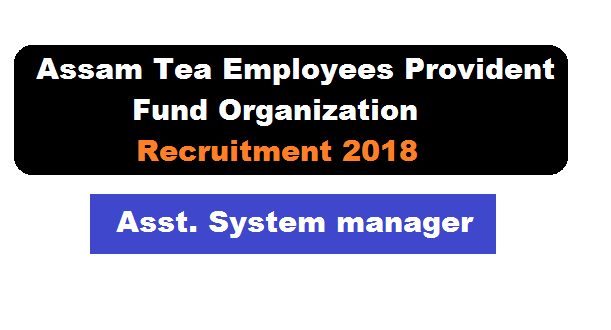 Recently Assam Tea Employees Provident Fund Organization has announced a recruitment notification for filling up Assistant System Manager posts. According to the Assam Tea Employees Provident Fund Organization Recruitment 2018 , A walk-in-interview will be held on the date and time mentioned below for selection of candidate to be engaged on contractual basis in Assam Tea Employees Provident Fund Organization, Nidhi Bhawan, Lalmati, Guwahati. We have discussed about this recruitment below. In this section, we will be mentioning details about the Recruitment of Assistant System Manager Under Assam Tea Employees Provident Fund Organization Recruitment 2018 with all the important requirement criteria to apply for the posts. Educational Qualification: Candidates must have passed Master of Computer Application (MCA) from a recognized university. Pay/Salary : Rs. 20,000/- per month. Travel allowances for visiting Field Offices shall be provided as per rules. Job Description: Selected Person have to assist the System Manager in maintenance/modification of the organization’s existing software, development of new software and in computer training of office personnel. Job location: Head Office, Guwahati. The incumbent may, however, be required to visit organization’s field offices across Assam from time to time. Experience: Applicants must have Minimum 3 years. Age Limit: 18 to 38 years as on 01-01-2018. • Excellent knowledge of Oracle llgR2 PL/SQL and SQL (including analytic functions). • Exposure with real time applications to deliver complex result sets within sub-second response times. • Ability to articulate data modelling concepts and explain their application to address design requirements. • Clear understanding of which Oracle features can and should be leveraged for any given design challenge. • Understanding why design choices directly influence resilience and performance taking into account Oracle’s capabilities and weaknesses. • Knowledge of Computer networks, Hardware, UTM, VPN. • Thorough knowledge of working on PHP with Oracle. • Exposure with real time processing of data with jQuery.getJSON, AJAX. • Knowledge of real time error handling, bug management, report generation. • Knowledge of both PHP and Java. • Experience of working on Redhat Linux environment and complete knowledge of accounting. • Knowledge of Financial accounts. Eligible and interested candidates may appear before the selection committee along with original certificates and mark sheets and their self-certified photocopies and a standard form of application duly filled in.